Shepler's Mackinac Island Ferry dock! These twigs ain't for buildin'. Mozzarella cheese rolled in bread crumbs, fried up & served with red sauce or ranch. Nuggets of Wisconsin white cheddar cheese lightly breaded and deep-fried. Served up with red sauce or ranch....Sooo good! Black beans, corn, onions blended with cheddar cheese and sour cream, baked 'til its got a crusty top, scoop it up with multi-colored tortilla chips. 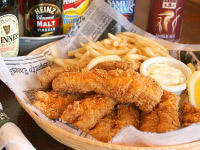 Tender chick'n strips, deep-fried golden brown, served with Bar-B-Q sauce or ranch. Everyone likes 'em. Jumbo chick'n wings tossed in one of our delicious sauces. Served with blue cheese dressing and celery sticks. Choose a sauce: Original Dixie Hot, Asian Ginger Zinger, Maple Bacon, Tangy BBQ or Habanero Sweet Heat. Crispy French Fries topped with cheese curds and brown gravy. Available with pulled pork on top. Fire roasted corn, jalapenos, red peppers and a creamy blend of cheddar & mozzeralla all coated in a light tempura batter. A 1/2 lb. juicy 100% pure Angus beef steak-burger cooked the way you like it. Add bacon and cheddar for a real treat. 1/3 lb Bison or organic beef patty cooked to your liking. A 1/2 lb. juicy 100% pure Angus beef steak-burger topped with crispy bacon, cheddar cheese, crispy onion rings and tangy BBQ sauce. A 1/2 lb. juicy 100% pure Angus beef steak-burger topped with pepper jack cheese, deep fried jalapeno & onion straws. Served on a Kaiser bun with a side of southwestern sauce. A 1/2 lb. juicy 100% pure Angus beef steak-burger topped with smked ham, swiss cheese, fresh sauteed mushrooms and onions. Piled high on toasted marble rye. Fresh ground steak-burger topped with a delicious, sweet & creamy onion sauce, served on a ciabatta bun. Slow roasted pork shoulder, hand pulled and slowly cooked with our signature BBQ sauce, topped with red onion & zesty coleslaw on a toasted bun. Someone got upset at the alarm clock. Chick'n breast lightly dusted in our house batter and deep fried to seal in all the juices. 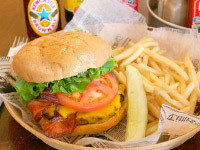 Topped with American cheese and served on a Kaiser bun. Also available chargrilled. Classic sandwich wrapped in a flour tortilla. Choose from turkey, ham, or chicken with lettuce, tomato, red onions and your choice of cheese. A meatless veggie burger patty topped with Monterey Jack cheese, covered with sauteed onions and peppers. 12oz hand cut ribeye chargrilled, you won't find a steak this good any sooner than you could catch a weasel asleep! 12oz prime rib seasoned & spiced down just right, so juicy you'll be as happy as the devil at a necktie social! Mackinaw's Biggest Steak! 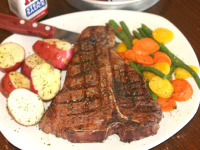 A 20oz select cut porterhouse charbroiled and seasoned with the dough wrangler's best effort. Did we mention that it's big? Our #1 Best seller! Over a pound! Fills up the hungriest outlaw, fresh 100% cod fish from the drink, battered & deep-fried, tartar sauce, wedge o' lemon. Eighteen juicy, beer battered shrimp, fried 'til they're done, free tartar sauce. Tender chick'n strips, deep-fried golden brown, served with Bar-B-Q sauce or ranch. 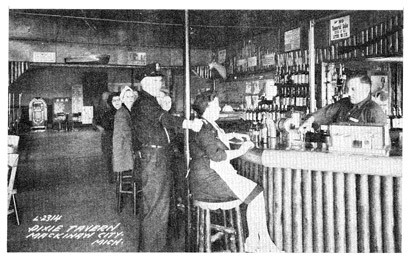 The Dixie Saloon is a must see attraction located at the corner of Huron and Central in Mackinaw City, right across from the Shepler Mackinac Island Ferry Docks. 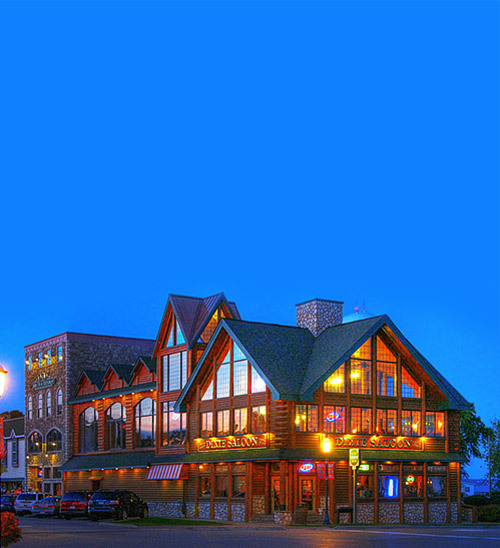 Sitting in the center of the downtown Mackinaw City shopping district, the Dixie Saloon has become the heart of Mackinaw City's night life offering a menu of Mackinaw's best steaks, ribs, and burgers and well as the largest bar in of Mackinaw City. The Dixie has live entertainment on weekends, year round, and Karoake during the week. 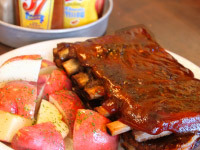 Ribs smoked and slow roasted tender, slathered in our Bar-B-Q sauce. You'll definitely need napkins. Half slab of our famous Dixie Ribs and some deep fried perch, a combination that will make your tastebuds get a wiggle on! Half of a succulent and juicy rostisserie roasted chick'n right off the spit, specially seasoned and burst'n with flavor! Fresh from Local Fishery! Fresh whitefish pan-fried, blackened cajun style, potato encrusted, or broiled. Fresh Walleye, blackened cajun style or potato encrusted, done up in the pan. Large portion of fresh perch, lightly battered, deep-fried and served with tartar sauce & lemon. Two hand made pasties: a hearty combination of beef, potato, onion and rutabaga wrapped in a golden flaky crust. Served with cole slaw and your choice of potato. Beef gravy available, so don't be afraid to ask. Romaine lettuce, tossed with croutons, parmesan cheese & caesar dressing. Available with grilled chick'n or shrimp. Same as the Big 'Ole Salad, smaller. Same as the chick'n caesar salad, no chick'n and pint-sized. Grilled chick'n slices on crisp salad greens topped with almonds and cherries, finished off with our sweet onion dressing.